Reduces Strain on the Foot and Ankle - Many office workers position one foot forward of the other while sitting, putting the foot into a position called plantar flexion. Plantar flexion shortens the muscles of the backs of the legs. Over time, sustained plantar flexion can cause the calf muscles to become tight and stiff which, in turn, can lead to a range of uncomfortable symptoms in the foot. The "rocking" option on the Remedease permits users to flex the ankle joint easily back and forth, promoting healthy movement at the joint, and reducing strain caused by sustained plantar flexion, or sustained dorsiflexion. These frequent small movements also promote better circulation, helping to reduce the risk of blood clots and varicose veins. Can Improve Upper Body Posture - Providing users with a stable and supportive surface encourages them to correctly utilize the back of their chair rather than "perching" on the front edge of their seat. This improved posture can reduce the risk of upper back, shoulder and neck pain. 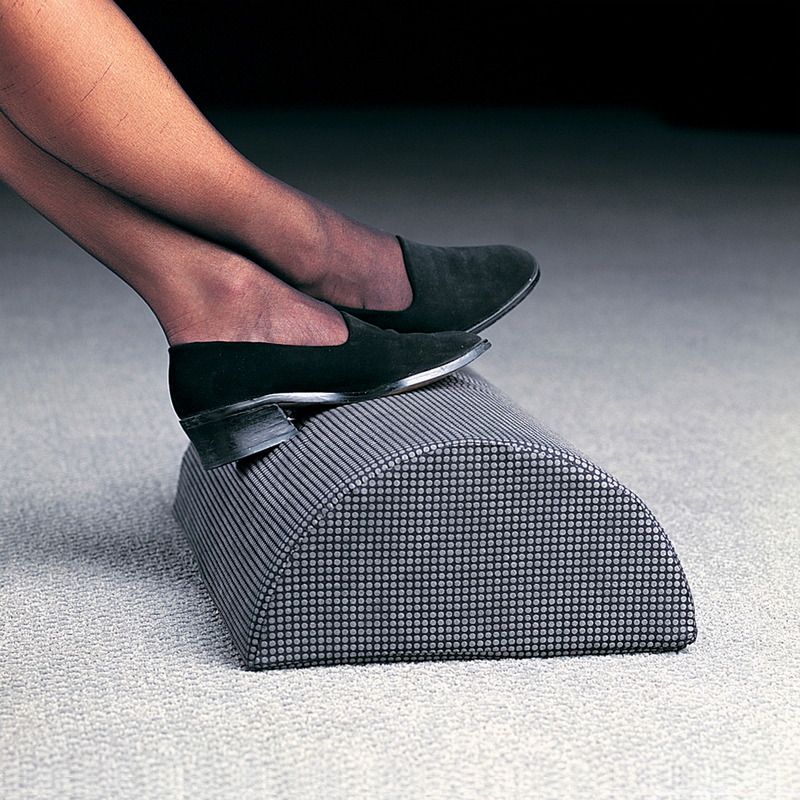 The height of the Remedease Foot Cushion ensures that even those of shorter stature can reap these benefits. 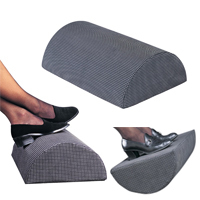 Promotes Good Circulation in the Feet and Legs - The half-cylinder design of the Remedease Foot Cushion means it can be deployed in either a fixed manner where users choose the most comfortable position over the curve or as a rocking (or non-locking) footrest, with the feet against the flat surface and the curved portion freely rocking on the floor. The second method of deployment encourages users to move the feet back and forth, promoting good circulation which can help to reduce the risk of blood clots and varicose veins. 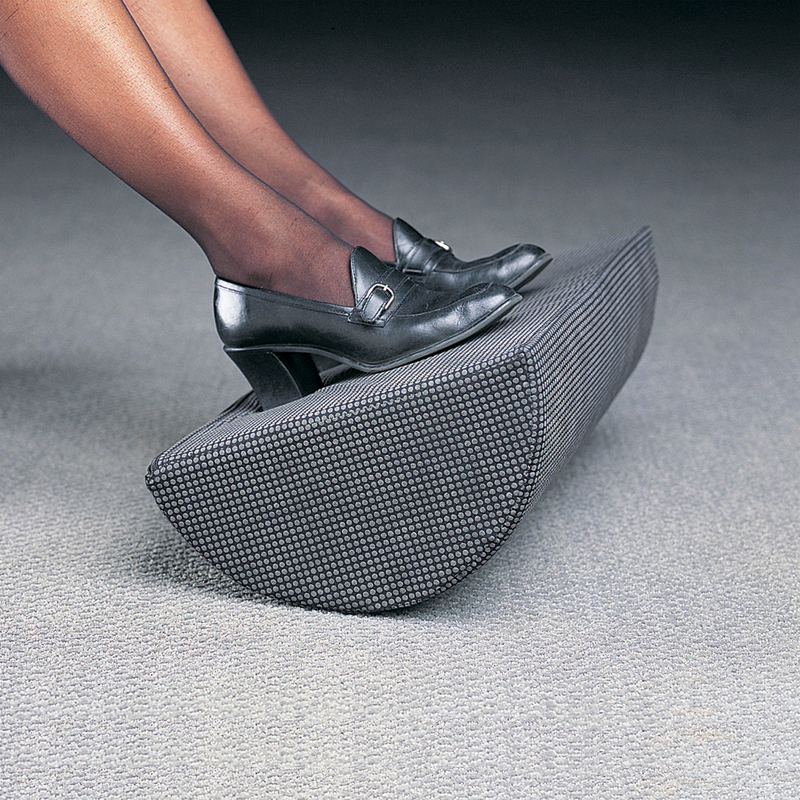 Simple Construction: The Remedease Foot Cushion has no hard plastic or moving parts to fail. It is comprised of a single piece of hypo-allergenic medical grade foam covered with a removable and washable nylon cover. Lightweight: The Remedease Foot Cushion is exceptionally light and weighs in at just 1 lb (0.45 kg) meaning it can be easily moved when necessary. Stable: The non-slip textured surface on the Remedease ensures that the feet remain in position while also serving to keep the cushion from slipping on the floor. Wide Support: The 17.5" width of the Remedease Foot Cushion provides plenty of space for comfortably resting both feet. 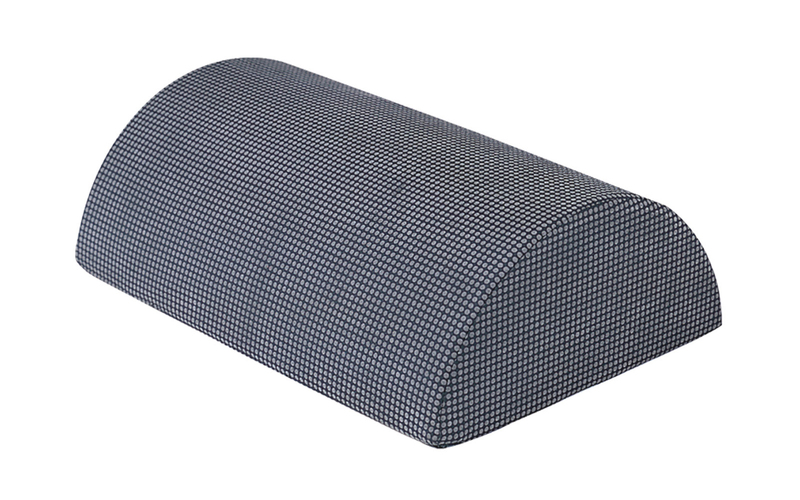 Comfortable: The foam cushion core of the Remedease Foot Cushion is firm enough to provide excellent support without the feet sinking in while retaining enough cushioning effect to provide comfort to tired feet (especially without footwear).